For those of you who know of the four-volume set Dictionary of British Arms: Medieval Ordinary, you know it's a great set of books, but one which may be a bit beyond many budgets. There is some recent good news about this set of books. 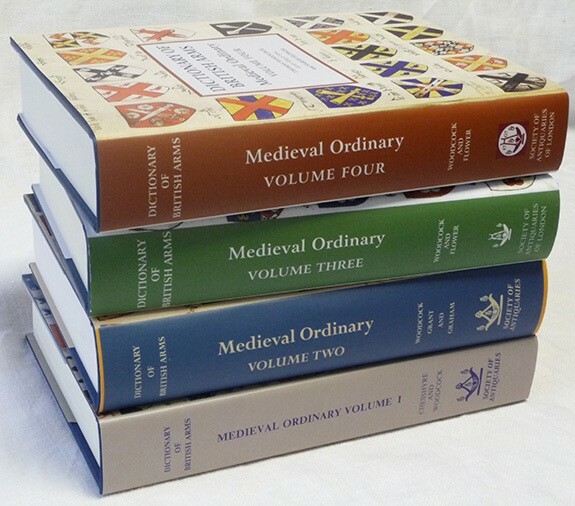 OAPEN, Open Access Publishing in European Networks, has digitized and uploaded all four volumes of the Dictionary of British Arms and these books can be downloaded from their website. You can visit the OAPEN website and see these digitized books at http://oapen.org/search?title=dictionary+of+british+arms&creator=&orcid=&serie.title=&subject=&isbn=&doi=&grantors=&grantors=&grantors=&collections=&pubdate=&pubdate-max=&smode=advanced, or go to the OAPEN Library main page at http://oapen.org/content/, click on "advanced search options", and in the Metadata box, type "dictionary of british arms" in the "Title" field, and then hit the "Search" button. I have also added the first link above to the section "Some Good On-Line Armorials" in the left-hand column of this blog, so you should always be able to find the link, even if you can't remember which blog post it's in. It is interesting to note how often a shield shape is used to exemplify protection. Continuing our walk beyond St. Thomas' Hospital, we passed a construction area which boldly announced that it was being protected by a specific security company. Oh, and guard dogs, which I think may possibly have been the bigger deterrent. The company's logo is an interesting combination of an heraldic shield, a clenched gauntlet, and a pun on it's name. If I had to try to blazon it, I would make it Quarterly argent and azure a clenched gauntlet grasping a rolled and sealed charter scroll fesswise whose margins extend beyond the edges of the shield azure. Admittedly, the larger image of the two on the sign reverses the tinctures, and makes the gauntlet and charter argent. Still, though, however quasi-heraldic and difficult to blazon the logo may be, it does tend to leave the viewer with a feeling of guardianship and protection, which is what you really want in a security company, isn't it? Well, if you're going to get a classroom full of high school students to enjoy studying Shakespeare, this is certainly one way to go about it! Teacher Megan Schott of St. Joseph High School got the students in her AP Literature and Composition course to take inspiration from their study of Shakespeare and his works to create a Renaissance doorway, which incidentally also won the Texas Renaissance Festival's Door Decorating Contest. The coat of arms, one of the main elements of the doorway, was created after the students researched Shakespeare's own heraldry, represented here by the tilting spear on the cross. The book represents literature, and the blue and white are the school's colors. Above the shield, acting like a crest, is what I would blazon as A dragon statant affronty breathing flames of fire proper. 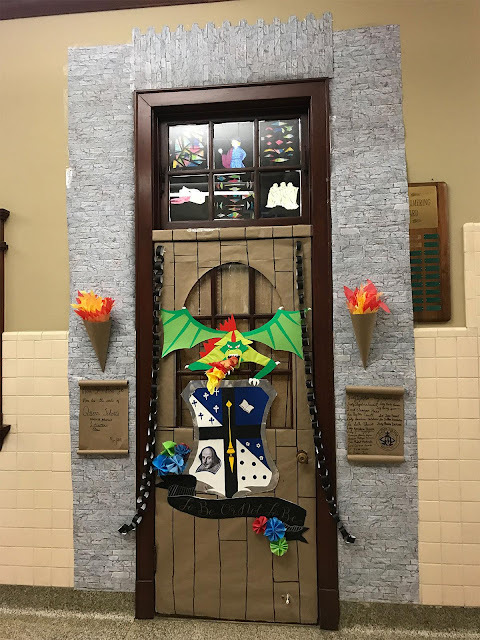 (The flames are three-dimensional, popping "off the door in a really ferocious way they were proud of," said Ms. Schott. The large, and busy, St. Thomas' Hospital on Westminster Bridge Road, London. Its arms, granted on February 14, 1950, are blazoned: Argent on a cross between in the first quarter a sword erect gules and in the second quarter a chough proper, a roach haurient argent, on a chief azure a rose argent barbed and seeded proper between two fleurs-de-lys or. The crest is: Between four spears points upwards sable embrued gules three Madonna lilies argent stalked and leaved vert. As supporters, it has: dexter, A chough proper; sinister, A nightingale proper. It is both unusual and gratifying to seen a modern organization displaying its coat of arms so boldly on the face of its building. In looking at the stained glass windows in St. Mary-at-Lambeth, I noticed a coat of arms that I found very familiar from our trip to Glasgow, Scotland. The window contains images of St. Ninian and St. David, with arms which are associated with, but not ascribed to, them. These are the arms of the City of Glasgow, which can be found all over that city in many forms, styles, and media, as I noted in my post of September 1, 2016 (https://blog.appletonstudios.com/2016/09/the-many-depictions-of-glasgow-scotland.html). So to find the Glasgow coat of arms here on the south bank of the Thames in metropolitan London was almost like running into an old friend there. Occasionally I'll run across someone who believes that heraldry, and the use of coats of arms, is something best left to the antiquarian, a moderately interesting field but one which has no practical application in this modern world. Fortunately, I am not the only one who believes that such people are either misinformed, or even flat-out wrong. Dr. Waring McCrady, a former French professor and graduate of The University of the South (Class of '59) in Sewanee, Tennessee, is helping the University commemorate its 150th anniversary by designing nineteen unique flags for each residence hall and to hang in the University's McClurg Dining Hall. 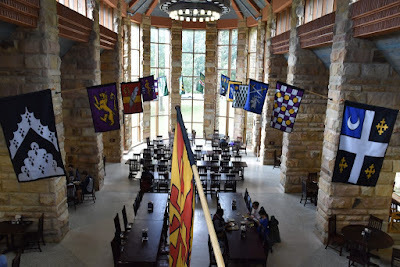 From what I can see, the flags - which are truly heraldic in nature - are well-designed and easily identifiable, two major underlying principles in heraldry. Amen to that, Dr. McCrady. Amen to that! In addition to the table tomb of Rear Admiral William Bligh and other family members and descendants in what is now the garden of The Garden Center (formerly St. Mary-at-Lambeth churchyard) (https://blog.appletonstudios.com/2014/11/entirely-unexpected-heraldry-in-london.html), is another marking the resting place of three generations of another family, the Tradescants. Five members of the Tradescant family are buried here: John Tradescant the Elder (c.1570-1638); John Tradescant the Younger (1608-1662) with his two wives Jane and Hester, and his son, also called John, who died aged 19. John the Elder and John the Younger were naturalists, gardeners, and collectors, who between them traveled to the Low Countries, Russia, the Levant, North Africa, and even North America to bring plants and other specimens back to England. The present tomb (above) is the third on the site of the Tradescant grave and replicates the original design. It was restored by public subscription in 1853. On the east side of the tomb is carved the family arms, on the west side a skull and a seven-headed hydra, on the south side broken columns, Corinthian capitals, a pyramid and ruins, and on the north side shells, a crocodile, and a view of some Egyptian buildings. But, of course, it was the heraldry that caught my eye. Unfortunately, I have been unable to find any reliable information about the Tradescant "family arms," which I would blazon (alas, without tinctures, as On a bend wavy three fleur-de-lis, impaling A lion passant. They do not appear in Burke's General Armory, Burke's Landed Gentry, Papworth's Ordinary of British Armorials, or any of my other armorials, ordinaries, and Visitations records. A review of Fairbairn's Crests for the crest here (Issuant from a chapeau a fleur-de-lis between a pair of wings) resulted in a list of the following names: Apeele, Apsley, Casson, Chamond, Chaumond, Crag, Cragg, Delins, and Edmonds. Nothing for Tradescant. Given the comparatively lowly origins of the Tradescants, father from Suffolk, England, and son born in Kent, and despite their being gardeners to the first Earl of Salisbury, the first Duke of Buckingham, and to King Charles I and his wife Henrietta Maria, it may well be that the arms here are borne without right. It may very well be that as "up and comers" in early 17th Century England, they felt that they needed or were entitled to a coat of arms as a symbol of their status, even without the approval of (or having to pay the fees to) the College of Arms. If that is true, it is certainly not without precedent. Remember that it was about this time that playwright William Shakespeare approached the College of Arms for a posthumous grant of arms for his father, which of course he immediately inherited, establishing his place in society as a gentleman. Something I hadn't known about when we visited there, but which I totally would have wanted to do if we had, is that local Lambeth legend states that if the Tradescant tomb is danced around twelve times while Big Ben strikes midnight, a ghost appears. Now that would be something to write home about! The other heraldic stone memorial which I photographed in the Garden Museum, formerly St. Mary-at-Lambeth Church, was to a former Rector of the Church, an ecclesiastic of some reknown. The Rev. George D’Oyly, D.D. during the period of his incumbency. Of course, it was really the carved and painted arms on the memorial which caught my attention. The crest is: A demi-dragon or winged sable holding between its forelegs a fleur-de-lis sable. It's a beautifully carved and painted marshaled coat of arms, though there is a little wear on some of the gold and red paint. The other colors, however, remain clear and identifiable. All in all, a very nice memorial to someone who clearly won the hearts of his parishioners.